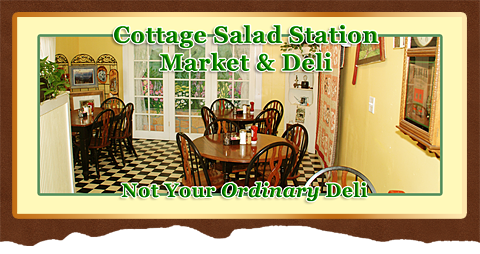 Known in the area as the Cottage Deli where you can have Breakfast everyday of the week, Lunch everyday and a Gourmet Dinner nightly. But there's more!! Cottage Deli carries the "Boar's Head" Brand Deli Meats & Cheeses along With Steaks, Lamb, Chicken & Ham. Plus Fresh Produce and Fresh Baked Bread Daily. Everything for you to eat at the Deli or take home! They are also known for their wide variety of catering services!